In this 3½-hour mini-workshop, students will be able to learn or brush up on techniques used in Saori weaving. Practice clasped weft, three-color interlock, making loops, windows and holes, and ripple weave (to name a few!) in a relaxed setting. Bring your own inside set and use either your own Saori loom or reserve one of our Saori looms. Bring any materials you’d like to play with, or use materials from the studio available for purchase before the workshop. This class is designed for current Saori weavers who either own or have ready access to a Saori loom. Thursday Open Studio Time students may reserve or purchase an inside set in advance and leave it at the studio fully warped and ready to work on. 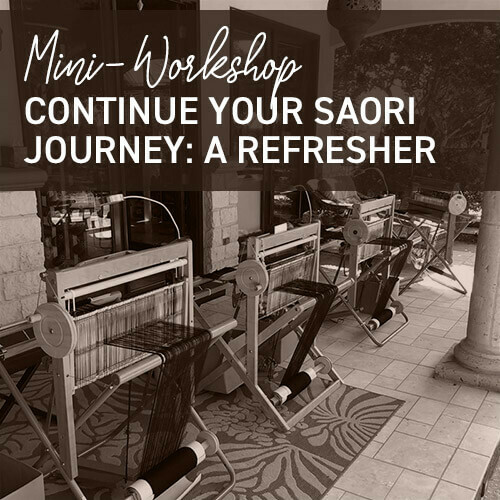 This fun class is designed to allow you to explore Saori weaving in more depth, while tapping into your unique creativity! You'll make and take home a "sampler" wall hanging.